The 'Rabbits and Bruins represented the Moore League at Tuesday's CIF Southern Section Swimming and Diving Masters Meet. For updated renderings of the proposed project, scroll through the gallery above. City Place is getting a facelift. This news is incredible for two reasons. Secondly, Studio One Eleven and its parent Perkowitz + Ruth will not only be heading the re-design of the space (scroll above for renderings) but move their offices from the tower at 111 Ocean to the space formerly occupied by Nordstrom Rack. These are the masterminds behind the lauded Senior Arts Colony. The brilliant Signal Hill affordable housing complex. The gorgeous Children Today facility. The parklets at Berlin, Lola’s and At Last Cafe. That beautiful, coastline gem that is the Bluff Hotel—oh wait, never mind: greedy and inept labor unionists shot that beautiful project down in the name of self-interest. To put it bluntly, Studio One Eleven and its architects are urban design badasses. The project’s boldness lies not necessarily in its architecture (and hopeful future tenants) but in its layout. North Promenade takes a few complete street cues and becomes pseudo-car-friendly. That is, bollards in place to prevent traffic but, should an event desire some food trucks, accessibility. Even more key is the project’s willingness to connect to the stretch of Promenade to the south. According to a press release from City Place, “Harvey Milk Park will also play a great role in the new district. 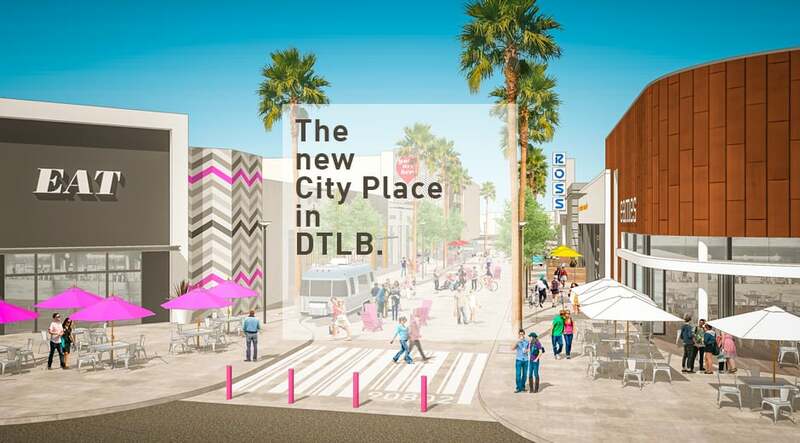 The project will build on the existing foundation and make it better by integrating into the adjacent downtown, and eventually repurpose the eight-block area into a vibrant mixed-use district featuring a hub of unique restaurants, businesses and retail for all the residents of Long Beach to enjoy.” Talks of Studio One Eleven possibly pushing back the public sidewalk space on Third even further in could also make the space not just great but spectacular. Even the loading docks that parallel Long Beach Blvd. will be revamped with living walls and art. As a way to get the community involved, City Place has asked the public to rename the joint.